Don’t let them go yet. It’s been two weeks, otherwise known as a couple of weeks, which is when the seller said I could probably safely let my birds fly. Of course, I’ve been looking forward to this day. My pigeons had all been doing very well. I had progressed to a couple of them landing on my feed bowl to eat while I was still holding it, and coming to the food when I called. I was feeding them once a day in the mornings and they were sticking to the upper levels of the coop, away from the ducks and chickens on the ground. I’d been researching how to coop train them and today was the day. I did a few things wrong today. I noticed when I came out this morning that a few pigeons were on the coop floor with the chickens. This likely meant that they had overcome their fears and had come down for some chicken pellets. First mistake: they might not be very hungry. I hadn’t fed them yet and assumed it would still be fine, since I noticed they don’t much care for the pellets and much prefer corn and wheat. Secondly, even though I’d read to only set them loose on a nice sunny day, I ignored this advice and let them out on a greyish, cloudy day. Not a rainy day by any stretch, but not as nice and sunny as we’ve been having lately. I opened the pigeon door and they timidly made their way out. Things looked good, they flew around the coop in ever widening circles and finally landed on the roof of my house. My one older bird stayed there and looked at me for awhile. A few minutes later I could only spot four birds, the younger four. The older bird was gone and I’m assuming he flew right back home. Darn it. I’d also read not to let them out while there were predators around. Well, there weren’t any hawks but I forgot about my cats. They were VERY interested in these birds on the roof and got as close to them as they could. The pigeons weren’t too happy about this despite my efforts to rein the cats in. After calling them, shaking the food dish, putting food on the landing pad to their doorway and then doing it all over again many times, they still haven’t returned. 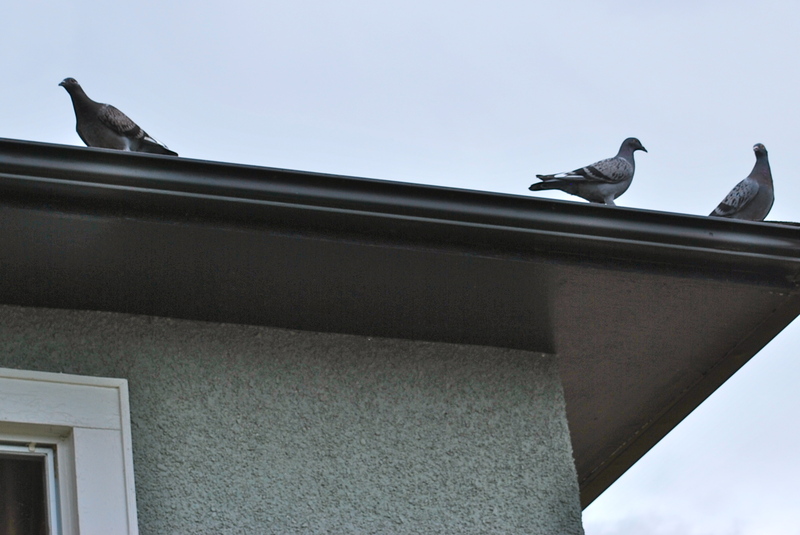 They hung out on my roof for a few hours looking a bit perplexed. They flew around and showed me some beautiful aeronautics. Right now they’re on the neighbor’s roof two doors down and it’s been over four hours since they were first released. Will they come back by nightfall? Will they come back at all? How will I get the door closed behind them without constant vigilance and no trap yet installed? I suppose I’ll find out. This entry was posted in homing pigeons and tagged coop training, first flight, homing pigeons. Bookmark the permalink. Children have been known to make their way home when they get hungry, perhaps homing pigeons may do the same thing. I’m hopeful. They’ve been hanging out on the coop roof and my back railing. They just have to figure out how to go back in the hole they came out of!